“You think you came to Romania to do something for God, but perhaps He wants to do something for you”. It was true that I was on a pilgrimage that had started when I was a child with an unusual thirst for spiritual things, but I really did not expect my searching to come to an end in Romania. I was raised in the conservative Wesleyan movement, and baptized at the age of 8. Even as a child I was willing to stand alone for my religious convictions, and I strove to live a consistent Christian life. I learned to play the piano while in Junior High, and soon my whole identity was wrapped up in music ministry. (2) that I was in a religious ghetto and needed to find the true Church. I found my way into the Reformed faith, which seemed to be the answer. No shortcuts, no superficial claims of sinlessness, lots of “Christian liberty”, and whatever couldn’t be explained otherwise was swept up into the mighty and mysterious sovereignty of God. The fact that it was a more intellectual faith also appealed to me at the time, as I was in the process of “upward mobilization”. Through marriage, however, I became part of the leadership of an independent evangelical congregation where “my” theology was tolerated, as long as it didn’t get in the way of the mission of our growing church. Everything was subservient to evangelism, everything was user-friendly, the visitor was king, and our still conservative Christianity was effectively marketed to the upwardly mobile that we considered our “target group”. My music ministry took a secondary place as I took on more administrative responsibility, eventually serving as Executive Pastor. All the activity and success with its unending pressure took a toll on our souls, and we felt that something was missing in all this. Going into midlife, we decided to break with this high paced, all-consuming ministry enterprise and to go for a second career in missions. I had dreamed of music ministry in Europe for a long time, and we decided this was the time. After a period of re-training and support raising, we were off to the university city of Cluj-Napoca, Romania: Mary and I, and our three daughters, Heidi, Heather, and Hannah. Despite some difficult challenges, we adapted well and were thriving after a few years. We learned the language, the girls were in public schools, and we even bought an apartment with the intention of staying long term. We were working with Baptist churches in worship renewal, especially in the area of music, and even beginning to compose some well-received songs in Romanian. Then our whole life was turned upside down by Orthodoxy, as devastating as any tornado that ever hit Kansas. I had nothing against Orthodoxy when I came as an evangelical missionary to a mostly Orthodox country. I didn’t see myself as a threat or competition to the majority faith. I did believe that the Orthodox Church, like older churches in general, was mostly dead, but I wanted to believe that there was some life and renewal in it. With pluralistic open-mindedness, I set about to find out what there was in Orthodoxy that was good, assuming that the roots of Romanian evangelicalism must be in Romanian Orthodoxy. By coincidence, I had read “Becoming Orthodox” while in missionary training, and was impressed by what I read. But I didn’t see much in Romania that resembled Peter Gilquist’s glowing presentation. Orthodoxy seemed tired, stale, superficial, superstitious, frightfully formal, or, as one person commented, “feudal”. Compromise and corruption, and a museum-like fixation with the past, were the impressions I got from the non-Orthodox people I talked with. The services in the Cathedral were like an opera without a plot, and it didn’t seem to matter whether you could follow what was going on. It was light years from the overhead projectors and didactic emphasis of churches I had been involved in! In another downtown church, where I would duck in to pray occasionally, people just seemed to come and go all through the service — if you could call it that — much in the way that the priest appeared and disappeared all the time behind the curtain in the iconostasis. The chanter seemed somewhere between bored and distracted; it was routine to him. Why didn’t anyone seem to be interested in communicating anything to the visitor? As one Romanian duhovnic recently said to me, it is truly a miracle that we became Orthodox in Romania. Absolutely no one did anything whatever to convert us. Convinced that there had to be more to Orthodoxy, I kept wanting to get to the bottom of this mystery, even though I was too busy to give it a lot of time. The opportunity came at last to get to know a priest who was “evangelical”, just what I was looking for. He was young, still finishing seminary, and in his fourth year of pastoring way out in a tumble-down village. Fr. Iustinian had been raised in a pious Orthodox home and had taken a stand for his faith under communism as a teenager, and now was in the priesthood. Not nominal or superficial in his faith, he was convinced of the claims that I had read about in Gilquist (and now others). After some discussion, I asked him to celebrate a Divine Liturgy in such a way that I could understand it. He took me into the Holy Altar, explained as much as necessary, allowing me to watch every action and hear every prayer. That day, in early May of 1995, I was “smitten” with Orthodoxy. I knew I had come into contact with a grace and a power and a holiness that I had never experienced before. It was unexpected. It was compelling. What to do? Our missionary career was just taking off, and our family was just feeling settled after the traumas of uprooting, relocating, enculturation, etc. We were fulfilled and excited about the future. I didn’t even dare to speak to my wife about it, as I knew this would mean an upheaval in our lives — one too many. Just at that time, we were scheduled for a summer furlough in the U.S.
As we came back, I was haunted by Orthodoxy, and felt compelled to take steps to pursue it. And yet, everything we had worked for and suffered for as a family was on the line. When my wife started to catch on, she warned me that she didn’t think the girls could take this. 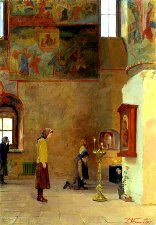 But as she began to study and pray about it, she, too, began to see the reality of Orthodoxy. After discussion with our mission society leadership, we decided that we must resign in order to pursue our newfound (and fragile) discovery. By mid-summer of 1995, we were embroiled in a heartrending conflict with loved ones, who felt betrayed and cheated. By the end of the summer, our “missionary career” was over and we were sidelined and stranded. Although at that time we came to the conclusion that we had been mistaken about Orthodoxy, trust had been destroyed and we were not able to resume our ministry. We went into a year of “exile”, working low paying jobs to survive and trying to get our wits about us. What had happened? What went wrong? How could we have been derailed so easily after a lifetime of Christian teaching and active ministry? Orthodoxy had seemed so beautiful, so right. It had put a new perspective on the unresolved questions and unsatisfied hungers in our spiritual lives. It was a new paradigm in which, suddenly, everything fit into place with nothing left over and pushed out of the doctrinal grid, as is the case with the doctrinal systems we were familiar with. It had seemed so true, so real, so much more spiritual than anything we had known. Could it really be a fantasy, as some said, or an abomination, as others said? We tried to pick up the pieces and get on with our lives. The girls were devastated, and their trust in us and others was deeply shaken. We felt paralyzed and lost. We had seen too much new light to go back to our former way of being Christians. We could not really be evangelicals anymore, and since we could not be Orthodox either, we tried to forge our own way, combining the best of both. It was a desperate attempt to make sense of things and to satisfy our frustrated thirst for Orthodoxy. In that state of mind, we returned to Romania on our own after our “year in exile”. It seemed we had to, for several reasons. We had left our apartment, car, and belongings in limbo. We had left our friends and colleagues without good-byes or explanations. Our oldest daughter, Heidi, was going to enter the University of Cluj, and so we pulled ourselves together and mustered our fragile faith and headed back. Of course the main dangling question was Orthodoxy. We had to “return to the scene of the crime”, to convince ourselves one way or another. We were graciously accepted back into our former Baptist music ministry, and we tried to make a go of working in a Protestant environment with Orthodox ideals. Outwardly it was fairly successful, but inwardly it was not satisfying. We knew that we had to give Orthodoxy another chance, this time a real chance. So in the summer of 1997, we took the plunge and started going to the Divine Liturgy on Sunday mornings. Through Fr. Gordon Walker of St. Ignatius Church in Franklin, Tennesee (whom we had met in 1995), we became friends with American converts who had also come to Cluj as missionaries. Craig and Victoria Goodwin introduced us to an Orthodox daily devotional publication, DYNAMIS, a ministry of their home church, St. George Cathedral in Wichita. Using DYNAMIS for our discipline of daily Bible study, things began to fall into place; questions began to be answered. We also began to overcome our intimidation and to meet more priests and lay people who impressed us with their truly Christian hearts and lives. The Archbishop of Cluj, BARTOLOMEU, granted us his blessing to begin translating DYNAMIS into Romanian and publishing it as a supplement to the Archdiocesan monthly. Through all this, no one made any effort to pressure us to convert, and even when we eventually requested to be received into the Church through Chrismation, no one was in a hurry. By that time, it was we who were impatient! Mary, Heidi, and I were chrismated on Pascha, 1998, in the village where Fr. Iustinian now serves. What a peace settled over us when we finally got out of the stormy seas of pluralistic, idiosyncratic, and eclectic Christianity and into the ark of the historic, original, continuing life of the Church! Heather chose to remain active in the Baptist high school and church, and having faced such trauma together over our conversion, we felt she needed the freedom to come to Orthodoxy if and when she is ready herself. Hannah was baptized a few weeks after Pascha of this year, 1999, just before turning twelve. It was a beautiful service, and a wonderful testimony to share with many who had taken their baptism for granted. With this milestone, we feel we have come a step deeper into the peace of the Church and closed another chapter in our pilgrimage. Conversion is not easy, either before or after Chrismation. There is so much to learn, and it is hard to go back to grammar school after a lifetime of leadership. In a way, it is like emigrating to a new country. You get your ticket and go; that is like being catechumens. Eventually you get your new citizenship; that is like Chrismation. But you still have to adapt to the new culture and find your place in it; that is like the ongoing process of working out your salvation once you are in the Church. Pat answers and instant solutions are not part of true Christianity. But there is a real opportunity for everyone who “strives for the prize” to attain the riches that our new Motherland offers us. Does it mean that there are not stumbling blocks and snares in the Orthodox Church? No. There are obviously many citizens in this new land who languish in spiritual poverty and disease, who, while they have the citizenship, do not cultivate the characteristics and privileges it offers. But there are towering examples of “success” to point the way for us. Dying to everything that is false and unworthy, first of all in ourselves, we find ourselves reborn as more human, more real, more peaceful, more settled, more healed, more loving and forgiving, even while we remain sinners. This is what Orthodoxy is about. It offers us real holiness, regaining the lost likeness of God; and we are not just given theories, but also the wherewithal. Fr. Rafail Noica, an eminent Romanian duhovnic and himself a convert to Orthodoxy, says that Orthodoxy is the true nature of man, “red, yellow, black, or white”. When we come home to Orthodoxy, we “come to” our senses, we become our true selves. Lord, where else could we go? Now we know why the Lord brought us to Romania. Our mission was to work out our own salvation with fear and trembling, and in so doing, to become a few more candles shining in the Church for those who, even in an Orthodox country, do not yet understand what their faith is all about. And perhaps for others who, like we were, are searching for something but don’t expect to find it in Orthodoxy. I sense that I am beginning that same journey. I am a music minster in an independent evangelical church. I am increasingly becoming more hungry for the sacramental life and worship that we do not celebrate or recognize. Like you this journey will be a trial of sorts as orthodoxy is no where near the radar screen of my wife and family. But I am continually drawn to the church. I am a doctoral student studying liturgy and the more I study the hungrier I get. This has ceased to be an academic exercise and I sense that there is a real struggle over my soul with regards to my worship and faith. I beg your prayers! Thank you for sharing your story. It is compelling, but I would encourage you not to use the word “convert”. Conversion implies that you have changed religions. You have not. You have merely changed denominations. I’m not arguing that it was a life-altering experience, but, hopefully, you still consider yourself a CHRISTian above everything else. If Christ is not the center, then everything else means nothing. Samantha, perhaps you are new to this site, but we use the word conversion precisely for that reason. Orthodoxy, for all practical purposes, IS a different religion – the original Christian faith.